A prototype model of the 10,000 year clock. Inside is the prototype of a clock meant to mark not the passage of minutes or hours, but of decades, centuries … even millennia. It's a timepiece designed to run for 10,000 years. "There definitely seems to be, like most things, two kinds of people," says Alexander Rose with a laugh. "There's the kind of people who get it right away. But then there's a whole side of people that think it's just crazy and it's a waste of time." You can guess which category Rose falls into. He's the director of the Long Now Foundation, a group dedicated to elongating the attention span of the human race. And it's no small irony they've set-out to break our habit of clock-watching by building, well, a clock. The clock project is the brainchild of one of the biggest brains around, Danny Hillis. He built his first computer in grade school and went on to design some of the first supercomputers. Tracy asked Hillis why humanity needs that change in consciousness. "If you get a really short sense of time, then you have a really small sense of what's possible," said Hillis. Hillis proposed the 10,000-year clock as an antidote to all that speed. "If we look at a problem like global warming or world hunger, it's pretty impossible problem, if you try to solve it in, say, a Congressional budget cycle or something like that," he said. "These are problems that, you know, just seem unapproachable. "But if you ask, 'Are we gonna solve those problems over the next 1,000 years,' absolutely! We humans have come a long way in the last 10,000 years, and we'll probably go a long way in the next." Indeed, the 10,000-year timepiece is inspired by the age of pottery pieces, among the earliest artifacts of our modern, agricultural civilization. Proposed designs for the full-scale clock call for it to tower sixty feet high and be nestled into the side of a mountain in eastern Nevada. 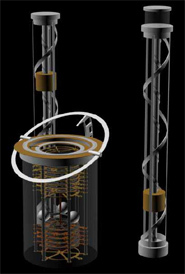 Powered by the Sun and built to the specifications of a deep-space probe, Alexander Rose says the clock will be engineered to keep on ticking without human help (just in case it has to). "The one thing we do know about all civilizations is that none of them have lasted," he said. "So we're trying to design for all of those eventualities." But should some future visitor find the clock and turn its crank ... he or she will hear it chime. "Why on earth does a clock burrowed inside a mountain need bells?" asked Tracy. "Well, the idea is that people come and visit," Rose laughed. "We wanted to give each group of people that visit a unique experience and to make that time their time." The latest prototype sports wheels eight feet in diameter - nearly a half-ton each. And Rose himself brings some weighty qualifications to the project: When he's not tinkering with clocks, he's battling 'bots. His robotic gladiators made him a favorite on the cable series "Battlebots." "Amazingly, it had a lot of parallels in that when you're building things to be destroyed at their fastest in three minutes, you learn about destructive modes of all kinds of things! It's kind of an accelerated aging chamber." And building a clock to stand the test of time certainly won't come cheap: Millions have already been spent, and millions more are needed. But by dipping into his own deep-pockets - and those of his high-tech friends - Danny Hillis hopes to keep his bid for immortality on a tight schedule. "Well, I'm only gonna live for so long," he said. "So, that's the real deadline for the project!"